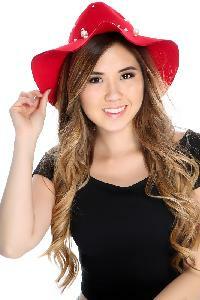 Stay stylishly shaded beneath this adorable hat. Whether your taking a midday stroll through the park or cheering on your top horse at the races... youll be perfectly pretty and fashionably protected from harsh sun rays. This totally cute hat is crafted of a soft wool, in a bold beautiful color, with a knotted side tie accent and is perfect for pairing with all your fave ensembles! Approximate hat measurements 22.5 inch circumference, 4 inch floppy brim and 100% perfect for letting your fabulosity shine!